by W. Bro. Helio L. Da Costa Jr. The tenets of Freemasonry are universal, however, the way in which they are presented to the profane, as he knocks on the doors of our temples, varies according to the ritual used at any particular temple. Although the lessons presented in these rituals may be similar, the way in which they are transmitted to the prospective initiate may be quite different from one area to another. Therefore, in order to acquaint the Brethren of our Grand Jurisdiction, the Grand Lodge of Ancient Free and Accepted Masons of British Columbia, with a piece of ritual widely practised throughout the world, but absent here, I propose to expound on the Chamber of Reflection. 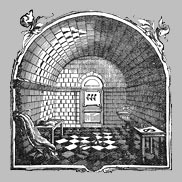 ...a small room adjoining the Lodge, in which, preparatory to initiation, the candidate is enclosed for the purpose of indulging in those serious meditations which its sombre appearance and the gloomy emblems with which it is furnished are calculated to produce. It is also used in some of the advanced degrees for a similar purpose. Before commenting on these symbols, let us follow a candidates journey into the Chamber of Reflection on the day of his initiation. The profane, dressed in a black (or at least dark) suit and tie, is brought to the Lodge building by his sponsor. He must not meet any of the other Brethren. The Treasurer and the First Expert, an officer, who in the rituals we observe here would be equivalent to the Senior Steward, both dressed without any Masonic insignia, meet the candidate. The Treasurer collects the necessary fees and returns to the Lodge room. The Expert stays with the candidate, while the sponsor also goes into the Lodge room. The Expert blindfolds the candidate and introduces him into the Chamber of Reflection and gives him a piece of paper with questions that the candidate must answer. He also indicates to the candidate that he must also write on the paper his moral and philosophical testament. The Expert also instructs the candidate that when he has finished this task, he should ring a bell to manifest that he is ready to proceed with the rest of the initiation. He is also told that once the door is closed he should remove the hoodwink. Once our profane does that, he sees the chamber and the objects described earlier. The soul at the moment of death, goes through the same experiences as those who are initiated into the great mysteries.The word and the act are similar: we say telentai (to die) and telestai (to be initiated) . Together with the crossbones, sickle and the hourglass, the skull naturally refers to mortality and is linked to the alchemical references also present in the Chamber. The alchemists aimed at transmuting base metals into silver and gold through the process of putrefaction. So must the profane transmute his nature, through a symbolical burial in the chamber, into a new transformed man in the form of an initiate. In alchemy this is called the great work. Indeed, mans refinement, transmutation and transformation from a brute base metal into gold requires great work! 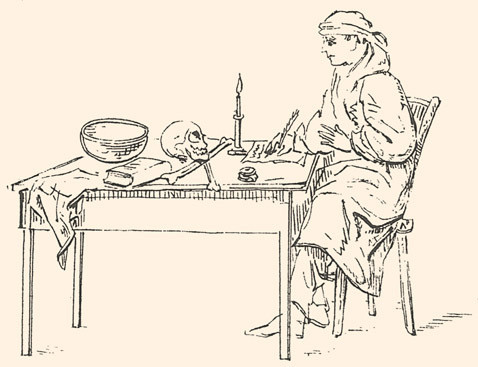 The skull in alchemy, named caput mortuum, is the epitome of decline and decay. The crossbones are usually tibias, the weight-bearing bones of the lower legs. The chunk of bread and the pitch of water are symbols of simplicity, pointing to the future initiate how he should conduct his life. Bread is made of wheat, an element connected to the goddesses Isis and Demeter. Isis is the Egyptian mother goddess and also the goddess of the dead, again, two of the aspects of the Chamber of Reflection. Furthermore, according to the ancient description of an initiation into the Mysteries of Isis by Apuleus, the candidate was placed in a secluded cell and subsequently participated in a ceremony in which he had to overcome trials. Demeter was celebrated at the great festival at the Temple of Eleusis, which became known as the Eleusinian mysteries. The bread and water represent the elements necessary to life, but even though food and the material body are indispensable, they remind the candidate that the physical aspect should not be the main objective in ones existence. Moreover, these elements remind us of the biblical narrative regarding the prophet Elijah, who is also connected with these elements and a cave (see I Kings 17: 8-11). He established a school of prophets in a cavern on a mountain. Furthermore, Elijah after eating bread and water, climbed the mount of G-d, in the same way that our future initiate nourished by these symbols can withstand the trials ahead and climb his own mountain. Elijah, once on the mount, also heard G-d as the still small voice, just as our candidate should follow his inner voice throughout his life, as we can read in I Kings 19: 5-13. Three of the alchemical elements used in the great work were sulphur, salt and mercury, all of which are present in the Chamber of Reflection. Sulphur is symbolical of the spirit, being a masculine principle, referring to enthusiasm and corresponding to the virtue of Faith. Salt is a symbol for wisdom, being considered neutral, as far as gender is concerned, referring to pondering (something the candidate does in the Chamber of Reflection) and corresponding to the virtue of Charity. Mercury appears as the rooster drawn on the wall of the Chamber of Reflection. This animal is connected to the deity Hermes, that is, Mercury. It is a feminine principle, referring to Vigilance and it also corresponds to Faith. As the rooster sings at dawn announcing the light of day, so it announces to our future initiate, the Light he may receive. This object is a reminder of mortality. It also brings to mind that time runs fast, just as the sand runs through the hourglass. It also conveys the meaning that we should make good use of the time given us. Moreover, our candidate is reminded that therefore, he should write his answers and philosophical testament within the allotted time. Vitriol is a sulphuric acid or a sulphate used in the alchemical operations of yore. This word is the origin of the adjective vitriolic, meaning caustic or hostile, referring to speech or criticism. However, in the esoteric sense, it is an acronym for the Latin phrase: Visita interioraterrae, rectificandoque, invenies occultum lapidem, which means: "visit the interior of the earth, and rectifying it, you will find the hidden stone." Some times this acronym appears with the addition of U.M. at the end, which means, veram medicinam, the true medicine. If one takes this advice metaphorically, the meaning conveyed is that, one must search within oneself, as the truth is hidden there, and this truth is the real solution to our problems. Again, a very appropriate acronym to be placed on the wall before the future initiate, while he has to write his philosophical testament. In some rites these two words are also placed on the wall. The word perseverance is placed under the hourglass, if one is not physically present but painted on the wall, while the word vigilance is placed under the figure of the rooster. These two words intimate to the candidate that he must possess these qualities in order to succeed in his Masonic life. The symbols, allusions, allegories and metaphors of the rituals are not plain. The Freemason must scrutinise them persistently in order to appreciate their richness and deep significance, and be vigilant that the lessons learned therefrom be not forgotten. Besides the profusion of symbols in the Chamber of Reflection, as our candidate removes the hoodwink, he will read various sentences on the wall. Most often he will read the following sayings: If you think we will find out your defects, you will feel uncomfortable among us. If curiosity spurred you towards us, go away. If you are capable of deception, tremble, you will be found out. If you take notice of human differences, leave, we do not know them here. If your soul is fearful, do not proceed! If you persevere, you will be purified, you will overcome darkness, you will be enlightened. As mentioned earlier, our candidate was given a piece of paper with questions, which he must answer in order to proceed with the initiation. The answers to the questions asked of the candidate become the initial point towards the elaboration of his philosophical and moral testament. The philosophical testament provides a glimpse of the attitude and character of the future initiate and is unique to each individual. The candidates true nature will be shown in his answers to the proposed questions as well as in his philosophical testament. On the other hand, it can also bring him discredit, depending on his answers. In the Chamber of Reflection, he has time to reconsider his request for admission in our Fraternity. If his motives are not pure as admonished by the writings on the wall, or if he is fearful and not courageous enough, then he might not be able to keep inviolate the secrets of Freemasonry. Furthermore, solitary in the Chamber of Reflection, our prospective initiate can ponder on thequestions presented to him, on his life, and future. Therefore, the reflection to which the title of this Chamber refers, is not just the pondering of the candidate, but primarily the reflection of his own inner being. This could bring him discredit in certain cases. Note that all the dictionary meanings of the word reflection invoked at the beginning of this exposition are represented in the Chamber and obey the same hierarchical order. In another ritual of French origin, the Rectified Scottish Rite, during the first degree initiation, the concept of reflection expressed in the sense of giving back a likeness as in a mirror, is revealed in another way. At the moment the hoodwink is dropped from the candidate�s eyes and he sees for the first time the faces of his Brethren around him, the WM says: "It is not always before oneself, that one finds his enemies. That which is to be feared the most is many times behind oneself. Turn around!" When the candidate turns he sees himself in a mirror! This means that the enemy can be also within! Incidentally, the word mirror is in Latin speculum, deriving from the verb speculor, which means, to scrutinise. That is exactly what one does in the Chamber of Reflections, as he scrutinises himself and the symbols around him. In the Brazilian Rite, the candidate in the Chamber of Reflection also receives another piece of paper that he must read. In it are found articles I and II of the Constitution of the jurisdiction, dealing with Freemasonry and its Principles. Moreover, he must also sign a declaration. After the candidate leaves the Chamber of Reflection, he is conducted into the Temple to be subjected to certain trials. Traditionally, the ancients and the alchemists believed that the universe was composed of four elements: earth, air, fire and water. Traditional initiatory societies,such as Freemasonry, have preserved this teaching. Furthermore, one of the marks of these esoteric initiatory organisations was a series of trials through which the candidate was subjected. The Chamber of Reflection, being a cave, becomes then, the first trial, that of the earth, and it is followed later by other trials, as it is made plain by the words of the ritual itself in the Ancient and Accepted Scottish Rite. As you can notice, Brethren, the rituals performed in the first degree in our Grand Jurisdiction are not similar to the ones I have been describing. To a Freemason only acquainted with the local rituals, the opera The Magic Flute by our Brother, W.A. Mozart is not as clearly intelligible as to those who have received their initiation in a Continental European rite or one derived from it. That opera was first performed at the Theater auf Der Wieden in Vienna on September 30, 1791 and it is in a certain way a re-enactment of a first-degree initiation with all its alchemical and Masonic allusions. The protagonists, Tamimo and Pamima are left alone in the darkness and required to keep a vow of silence. A scene at a vault, and tests of fire and water follows this. Even without going beyond the scope of this exposition, and presenting the rest of the first degree ritual as performed in most countries of the world, you can imagine what an impression this initial part of the ritual makes on a candidate being ushered into our honourable institution. The Chamber of Reflection teaches, indeed, powerful lessons. True initiation is an individual internal process. Nobody can transform a man but himself. Others may guide and help, but ultimately, the individual alone is the only one who can perform the great work. The Chamber of Reflection truly epitomises this process. It is my hope, that those of us, who have not experienced this ritual in our Masonic life, have at least derived some small benefit, although vicariously, from this allocution today. 1. Ambelain, Robert. Scala Philosophorum ou la symbolique maconnique des outils. Paris: Edimaf, 1984. 2. Bayard, Jean-Pierre. La spiritualite de la Franç-Maconnerie. St-Jean de Braye: Editions Dangles, c1982. 3. Boucher, Jules. A simbolica masonica. Sao Paulo: Editora Pensamento, c1979. 4. Hamilton, Edith. Mythology. New York: New American Library, c1969. 5. Holy Bible. Temple ill. ed. Nashville: A.J. Holman, c1940. 6. Mackey, Albert G. An encyclopedia of Freemasonry. New and rev. ed. Chicago: Masonic History Company, c1927. 7. Manual de aprendiz macom segundo o sistema do rito brasileiro. Brasilia: Grande Oriente do Brasil, 1986. 8. Oxford Dictionary of Current English. 7th ed. Oxford: Oxford University Press, c1984. 9. Papus. ABC illustre díoccultisme. 8e ed. Paris: Editions Dangles, 1975. 10. Ritual rito Escoces Antigo e Aceito 1o grau aprendiz. 6a. ed. [Brasilia]: Grande Oriente do Brasil, 1986. Illustration reproduced from A Ritual and Illustrations of Freemasonry, accompanied by numerous engravings, and a key to the Phi Beta Kappa. London : Reeves and Turner, 1896, Strand. Printed by W. Bowden, 23, Red Lion Street, Holburn. 254 p. 11 cm. x 17 cm. Small illustration reproduced from The Freemasons Manual containing the First, Second and Third Degrees of Freemasonry : embellished with symbolical illustrations, together with installation, consecration, and dedication ceremonies, etc., also, Rules and Regulations for masonic trials, forms for minutes, by-laws, &c. compiled by Thomas Sargant, 32° adopted for the Dominion of Canada. Toronto : Masonic Publishing Co. 1880. hc 253 p., p. 31.